About 1.5 miles southwest of the Downtown Project's cluster of development in Las Vegas is another creative neighborhood going through changes. It's named 18b. Depending on who you talk to, that stands for the size of the area ("18 blocks") or the number of the land parcel. But pretty much everyone just calls it the Arts District. Even though the walk from the Downtown Project area only takes about 20 minutes, the landscape changes dramatically. I leave the office and hotel towers and head south down Las Vegas Boulevard, which I think at first could almost be a major street in L.A., until I encounter the cluster of wedding chapels and the blocks-long line outside the pawn shop featured on the show Pawn Stars. As I turn west into a new neighborhood, I realize the character of the Arts District is wholly different than downtown proper. I see single-family houses, for maybe the first time on my entire trip. Industrial buildings converted to gallery spaces. Garages thrown open with signs of artists inside at work. I meet art writer Ed Fuentes there for lunch so he can introduce me to some of the local artists and gallery owners. We eat at Bar + Bistro, at large wooden tables shaped like artist palettes, complete with haphazard splotches of paint. Outside, 45-foot neon paintbrushes by sculptor Dennis Oppenheim are plunged diagonally into the sidewalk at several intersections to brand the area. Murals and graffiti cover nearly every surface. It felt cozy and familiar and—after spending the morning at the Container Park—refreshingly authentic. In many ways, the Arts District in Las Vegas is experiencing the same challenges that most urban artist communities are facing as the neighborhoods around them gentrify. As studios and galleries get replaced with other businesses (which in Vegas are almost always bars), there's been a movement to try to keep artists in the district. An online petition that closes at the end of this month in response to a ballet school being possibly evicted from the area only has 182 signatures out of a goal of 1000. Native Bobbie Ann Howell has witnessed commitment to the arts wax and wane in Las Vegas, from her days working as a cultural coordinator for the city ("Until they sold our cultural centers," she says); to finding a studio for her own practice as an artist, designer and printmaker; to her role here in the Arts District at Nevada Humanities, a nonprofit that funds art and literature programs. The biggest challenge, she says, is just letting people know they're there. "We need to get people to come here and find a place in their lives for art." Over a decade ago, the area launched First Fridays, the typical gallery opening/art walk extravaganza you'll find in most art districts. In 2011, the nonprofit that ran the event was acquired by the Downtown Project. On one hand, that's a positive thing, says Howell. "It's good news—something created by the community became a commodity and they're putting substantial funds into it," she says. As First Fridays have grown into a full-blown festivals, there's been some friction: A poorly crafted statement said that the new leadership would bring in "better" artists (ouch), which was followed by some logistical issues. There's been a lack of communication to the galleries about programming, street closures, and security, including a barricade at a recent event that cut Nevada Humanities off from the action. Last month, an estimated 30,000 people attended, ferried via shuttles from downtown, where there were more art events. Again, these are pretty similar problems to what most successful art walks are facing across the country. But most art walks don't have the backing of an estimated $500,000 annual investment. Howell is optimistic, even about the growing pains. "That's what's really important, that they're trying to draw people from across the valley to something in the downtown area," she says. "Anything that brings attention to us is a good thing," agrees designer Zac Erickson. Erickson, another native, has a woodshop—a garage, really—on Colorado, a street lined with 1950s ranch houses which have been converted to art spaces and antique stores. The rent is affordable and he likes the vibe, which is not the same as that of artist spaces he's seen downtown. "I don't want to put them down, it's just different—it's Walt Disney's version of a neighborhood." The Arts District is not Disneyfied but it is segmented. The bigger institutions have plenty of visibility up on busy Charleston. 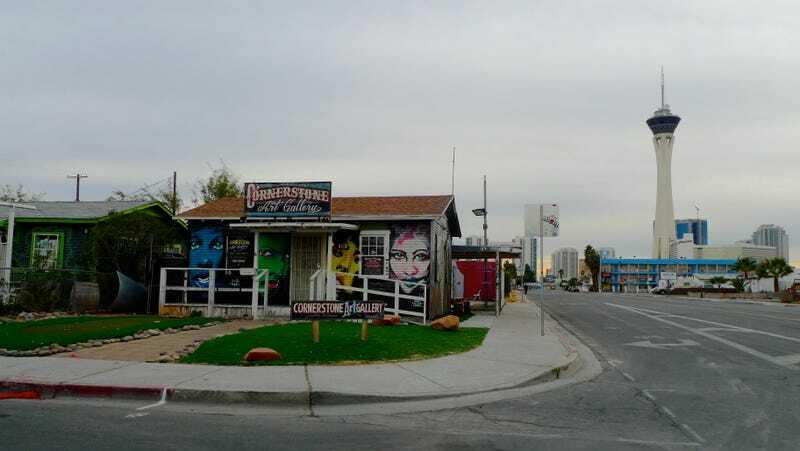 Two blocks away, Erickson's shop, with his carved stools and toys spilling out onto the sidewalk, is the only sign of life on Colorado on the day I visit. Many of the other galleries are not open on weekdays, and the next cluster of activity—some antique shops—are a few blocks away. Erickson knows the challenges and he's invested in the neighborhood. "We're trying to hang on to our little spot and make this street a destination," he says. "It's not very often but people actually come here from out of town to walk down the street." That might change quickly since the Arts District is on the cusp of its own major revitalization project, thanks in part to former video game designer Brett Sperry. Sperry sold his software company Westwood Studios to Electronic Arts in the late 1990s and devoted himself to the art community, developing Art Square (where Nevada Humanities is located) and his own Brett Wesley Gallery. And he's now leading an ambitious proposal for a new Modern Contemporary Art Museum, which would occupy two acres owned by Sperry in the heart of the Arts District. Talk of the new museum proposal is met with enthusiasm… and plenty of worry that it won't happen. Sperry's plan will cost $29 million; $2.4 had been raised as of November. This is a more daunting challenge than it seems, as the city currently has no physical contemporary art museum. The Las Vegas Art Museum closed in 2009, and an outpost of the Guggenheim Museum at the Venetian failed after seven years. (There's plenty of art in the casinos, but it's of the variety that art writer Fuentes calls "captured and killed"—not part of a community-focused program.) The museum would be a game-changer for not only the Arts District, but for a city that desperately needs more cultural and educational institutions. As I made my way back to downtown, in a car this time, I realized that the distance between the neighborhoods was shorter than the 20-minute walk felt. What would really make sense is to connect the two neighborhoods, not just with a shuttle once a month, but with spikes of arts-focused development all along the way. Both Casino Center and Las Vegas Boulevards draw pretty much perfect diagonals between the districts. This could be a way for the Downtown Project to construct a cultural corridor that stretches all the way from East Fremont to the Arts District. Designing a truly walkable neighborhood might be better received by the city than a Tesla car-sharing program. Or how about this crazy idea: When it comes to arts funding, why stop with First Fridays? The Downtown Project could show its commitment to the city by investing in the art museum, creating an important, permanent anchor for the arts that absolutely delivers that "return on community"—and also strategically expands their reach into another neighborhood.